Earlier this week, the CBO (Congressional Budget Office) released a report titled "Report on the Troubled Asset Relief Program - November 2010". In October of 2008, during the height of the financial crisis, the Emergency Economic Stabilization Act of 2008 was signed into law by President George W. Bush. The Emergency Economic Stabilization Act of 2008 established the Troubled Asset Relief Program (TARP). TARP gave the Department of Treasury the authority to spend up to $700 billion on the purchase of failing bank assets in order to shore up the financial system and restore confidence to credit markets. In addition, the Department of Treasury also sought to provide capital injections to banks through TARP. TARP was much-maligned at the time, and many people wondered how the federal government could just give away $700 billion in taxpayer's money to the very institutions that had gotten the country into such a mess in the first place. 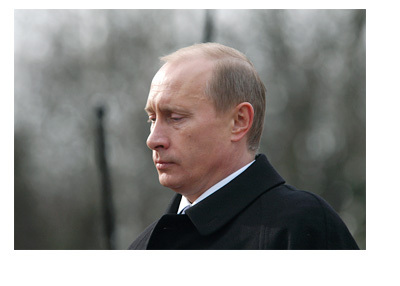 In reality, the $700 billion figure was pretty much plucked out of the air during the height of the crisis. A number had to be agreed upon before President Bush signed the bill creating TARP into law, and $700 billion was the agreed upon number. In the Dodd-Frank Wall Street Reform and Consumer Protection Act, the maximum authority for TARP was subsequently reduced to $475 billion. 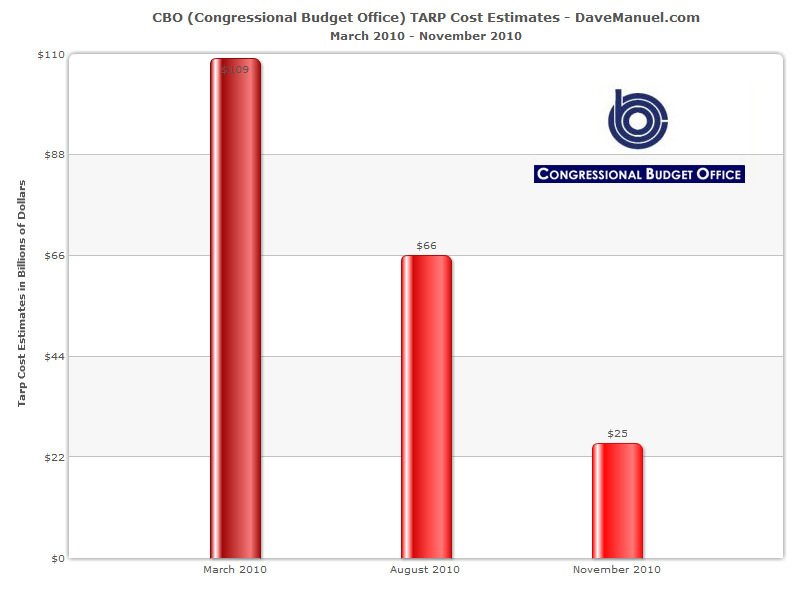 According to the CBO, the total cost to the US taxpayer for TARP is now estimated to be around $25 billion. 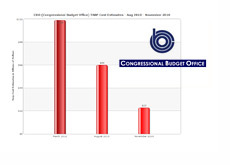 This is significantly less than previous estimates from the CBO, and is also significantly less than the OMB's (Office of Management and Budget) current estimate of $113 billion. The CBO states in their report that the total cost of TARP is now only $25 billion due to a stabilized and improving financial system, which has resulted in many of the transactions that were undertaken by the government receiving "favorable" outcomes. In March of 2010, the CBO estimated that the total cost to taxpayers of TARP would be $109 billion. In August of 2010, the CBO estimated that the total cost to taxpayers of TARP would be $66 billion. In November of 2010, the CBO estimated that the total cost to taxpayers of TARP would fall once again, this time to $25 billion. 1. Market Value of Treasury's CPP (Capital Purchase Program) and AIG investments increased. The Capital Purchase Program saw the Treasury Department purchase $205 billion worth of preferred shares from 707 financial institutions, and most of this money has already been paid back (resulting in a profit for the government). 2. Estimated cost of Assistance to the auto industry fell from $34 billion to $19 billion. The CBO points out that auto companies have settled or repaid much of their debt and seem to be on solid financial footing now. 3. Estimated participation in Treasury's mortgage programs declined, resulting in total expected reduced expenditures of $12 billion (down from $22 billion). 4. Treasury's authority to fund new programs under TARP has expired. In short, the estimates for the total cost to the US taxpayer for the Troubled Asset Relief Program continue to be whittled down, and are now currently sitting at $25 billion.